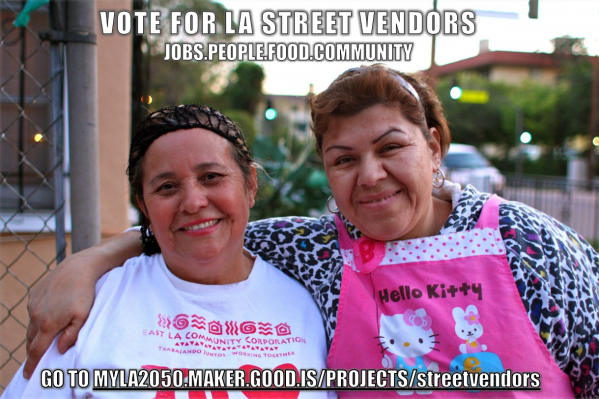 Recently, a program directed to aid street vendors was awarded $100,000 as a part of the LA2050 contest. East Los Angeles Community Corporation and Leadership for Urban Renewal Now’s proposed a program that will bridge the gap between brick and mortar businesses and street vendors, and a venture capital fund for street vendors. While ELACC has worked on the idea of a program to help street vendors on the conceptual level, they have not been able to create a broad program to help a greater number of vendors. The LA2050 award money will help create the “Venture Capital for the ‘Hood'” Fund, a source for street vendors to get money to buy products, equipment, hire staff, or pay for permits. Vendors will give a minority stake to ELACC/LURN and will be advised by one of the group’s staff members to help grow the business. ELACC has worked with a handful of street vendors since 2007, helping them get equipment that compiled with health and safety codes, and connected them with resources on how to create business models and receive loans. The LA2050 grant will also aim to close the gap between brick and motor and street vendors. While brick and motor have complained that street vendors take away businesses, vendors can work with them, said Gracian. One of the street vendors ELACC works with struck a deal to sell pupusas in front of a convenience store, but to not sell drinks in front of her stand and instead directs them into the store. “We see in commercial corridors, to have a successful street vending program, it needs to engage residents, street vendors, and businesses, that may support or see it as a threat,” said Gracian.